Cheerful social history follows the career of General Mills’s long-lived celebrity spokeswoman. 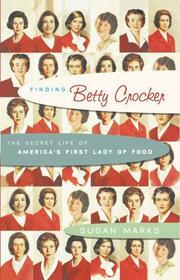 First things first: Betty Crocker isn’t a real person. She was created, in an unwittingly brilliant move, by the publicity department of Washburn Crosby, makers of Gold Medal Flour, after a magazine contest brought in a flood of cooking questions to the company. The letters were answered, but the male publicity director certainly couldn't sign his own name to the responses; thus was Betty created. Her last name was given in honor of then-recently retired company director William G. Crocker, but her first name was chosen simply for its “wholesome” sound. From these simple origins, an empire grew—one supported by a large staff of cooks and home economists who were constantly testing recipes and looking for kitchen innovations. Betty was a radio pioneer, with a first show debuting in 1924 and, later, with her Betty Crocker Cooking School of the Air. She went to Hollywood in the ’30s to interview the stars, Marjorie Child Husted being the public face of Betty Crocker on these occasions. Betty assisted homemakers in stretching their budgets during the Great Depression and offered innovative ways to cook with rations during WWII. And while Betty Crocker was always firmly in the woman-as-homemaker camp, she advocated greater recognition for what was often thankless work, creating the Betty Crocker Home Legion. In the 1950s, Betty Crocker offered convenience foods—Bisquick, cake mixes—that matched the shiny new postwar prosperity. Though her popularity hit its high-water mark in the middle of the 20th century, she remains a force even in the General Mills of today. Marks excels in putting her subject in context, and alongside her historical account, she places numerous letters from women who wrote to Betty to ask questions or inform her about their lives. Like a Betty Crocker recipe: goes down easy.